⁠⁠⁠⁠⁠"If you can't appreciate what's on your doorstep, then travelling will do nothing for you." With this sentiment in mind, we decided on the Derryveagh Mountains area in northwest Donegal for SP8. This is one of the most isolated regions in Ireland, taking in the magnificent Glenveagh National Park and the iconic Errigal Moutain. As we arrived in Dunlewey on the Thursday night, we had no set route in mind for our three-day hike and camp in the surrounding wilds. With darkness falling, and checked into the Errigal Hostel, we headed to McGeady's bar to better plan our trek over a pint or two. Thankfully there we met Joe, a locally resident Scot who soundly imparted his expert knowledge of the area to us. 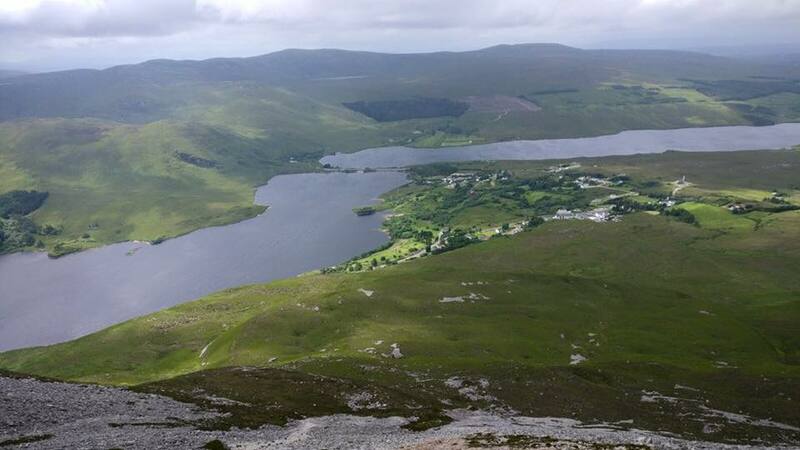 We began our hike on Friday morn from the causeway between Lough Nacung Upper and Dunlewy Lough, trekking up along the Sruhannemeel Stream and then crossing the Delvin River plateu to summit Slieve Snaght. Descending northwest off Slieve Snaght, we passed along the northwest shore of Loch Shliabh Sneachta (Snow Mountain Lake) and up Drummaliffernn Mountain, descending thereafter between Lochs Taribh Mór and Tairbh Beag (lakes of the big and little bull). Ascending from there via Cnockfadda col, we then headed due east to eventually pick up the track that leads to Lough Beagh. Upstream of the inflow we found a nice wild camping spot under mature woodland to refresh, fish, cook up and set up our bivvys as the sunlight declined. The next morn, leaving our camp as we found it, we made our way along the north shore of the lake to began our steep ascent from the valley floor northwards towards peak 555, the rain progressing in intensity as we climbed. Dense mist increasingly closed in around us as we summited Dooish (652m asl). The conditions were unexpectedly miserable, at least at these elevations, for early July. The descent off Dooish (via Bunnastreesruhan) took us into valley below and towards Loch Alltáin where we hoped to make camp that night. Unfortunately the paucity of firewood and shelter there necessitated a 3 km back-track to set up camp in a patch of coniferious forest we had passed earlier. The camp really came into its own once the fire was blazing and this against the backdrop of our bush-crafted wicker fence sheltering us from the westerly breeze. A heroic resupply of mead, which will long be regaled in Survivor Paddy 'lore, further elevated the already high morale. On the final morning we summited Mount Errigal, descending this iconic monolith via a very steep scree slope. This direct exit route is seldom taken and certainly not for the faint-hearted. We also got a bit of fly fishing in before we all regrouped back in McGeady's in Dunlewey for a few celebratory pints of the black stuff in the kind company of the gracious locals. 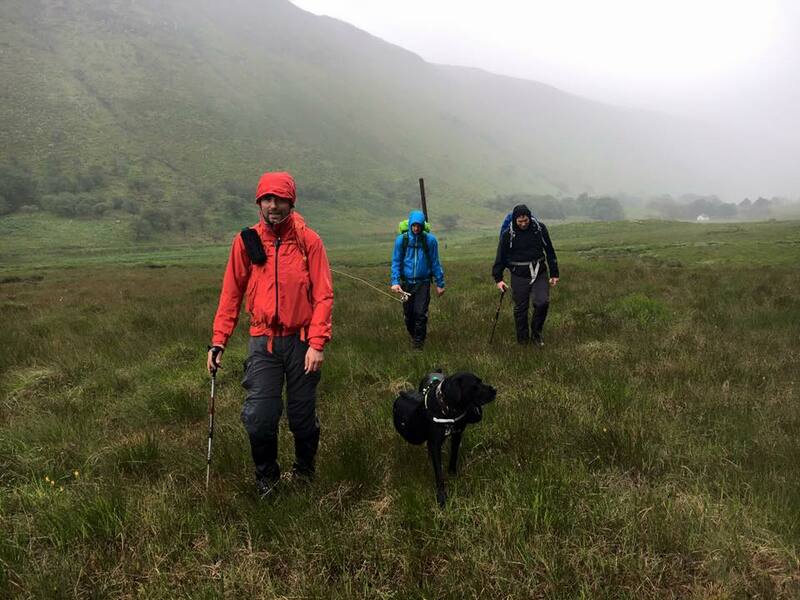 It would be remiss of us not to mention Cowboy, our loyal and faithful canine, who led the seven of us every step of the way on this epic adventure through the majestic, wild highlands of northwest Donegal. Ireland is an amazing place, full of secret gems. For a small country to be able to find a wild, aww inspiring wilderness like Donegal is just awesome. We hiked trails following wild deer paths, summited empty peaks and blazed the boglands of years gone by. The kind people of Donegal must be acknowledged (Joe, Sinéad, Michael et al.). They are a rare breed of sound, sound people, full of local knowledge and happy to help out. Tog go bóg é ar scáth na sléibhte!